I noticed that there aren't a lot of comments on this blog but I did want to say that I, for one, follow your blog closely and appreciate the work that you are doing. Thanks! Thanks for the comment, and glad you enjoy the blog. Across the blogs I guess I get just about the right number of comments for me, neither too many, nor too few, and, thankfully, very few totally stupid ones. Even those who want to disagree normally do so in an intelligent way. But basically, too many comments are very time consuming, if you try to answer them seriously. 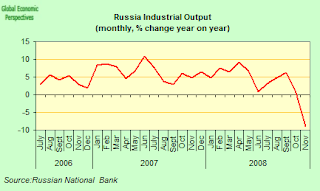 "So the ruble is falling and the reserves are flowing out at a rather fast rate, but this is not producing inflation in Russia - in fact quite the contrary, disinflation is very strong in Russia right now, and indeed if things continue at this rate (especially given the sharp contraction in internal demand) deflation and not inflation is going to be the big headache." 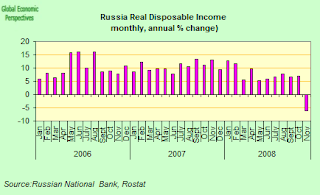 Isn't this just wonderful for counteracting the inflationary effects of ruble correction and fiscal expansion? 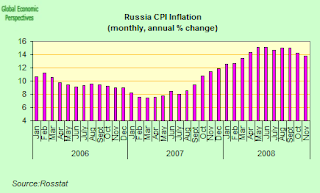 "Isn't this just wonderful for counteracting the inflationary effects of ruble correction and fiscal expansion?" Well it is if it is only a short sharp shock, but the big danger, as we have seen in Japan, and this is what Bernanke is worried about in the US, is that deflation expectations set in, and then get stuck. They are then really, really hard to shake off. This is going to be the big issue of 2009 - since recessions and contractions all round are now more or less guaranteed, the question is: does the global economy get stuck in deflation? My guess is that this pretty much depends on whether or not they have to devalue the yuan (unknown at this point). We just have to watch and wait. We now know what happens next, but we still don't really know what gets to happen after that. I think serious deflation is coming in Spain, and I am not optimistic here. Watching and waiting, and have a good holiday season. Why actually is it getting so bad in Eastern Europe? My impression is that it was battered by the crisis more than any other region in the world. Don't you have anything better to do on a Saturday than worry about all this either :). 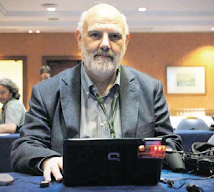 Actually I am banging my head on my computer at the moment trying to understand the difference between quantitative easing in the US and in Japan. It is a very complex topic, and there is a point here, since one of the things about economics is that it is an enormous topic, a lot larger than most people think, and it is difficult to keep abreast of all of it. This is what I am complaining about here, I am pretty much at home with all the standard nitty gritty of macroeconomic data as in this post, but I am absolutely out of my depth when it comes to the question of how central banks build their balance sheets. Actually with the way Bernanke is revolutionising the topic I imagine most people are. But my point is that given all this complexity, one of the things we are struggling with is that probably no one understands all the different departments, and yet to get a grip on things you really need to understand all this as a whole. So when we come to assess policy makers I think we need to remember this. "Why actually is it getting so bad in Eastern Europe? My impression is that it was battered by the crisis more than any other region in the world." I think your impression is right, things are getting bad, and they are likely to get worse. Indeed the CEE countries are likely to shoulder the brunt of this crisis. Why is this? Well that is complicated. What I would point out is that I more or less predicted this as soon as the sub prime crisis really broke out in August 2007, in this post here among a lot of other stuff. Now this prediction wasn't based on necromancy, or on the theories of Nostrodamus, but on the straight application of some simple economic theory. The heart of the problem is that for all sorts of historical reasons these countries are "out of phase" in their economic development, since they have passed through the demographic transition at one velocity and through their economic and social one at another. The problem of being "out of phase" has been exaccerbated by the globalisation processes, since if you consider that one of the problems about having rapid economic growth and sectoral transitions with long run low fertility, then this is made worse by having movements of people in one direction (westwards) and movements of capital in the other (via remittances, FDI and those stupid forex loans). Claus Vistesen and I have lots of theoretical posts about all this across the blogs, but maybe this one by Claus is pretty much to the point. Obviously all of this at this point is pretty much conjectural. Various theories are possible, and what we need to do is assemble them and then test them, although I do think it is important we get some progress on this front soon so we can take some remedial action. What I do think is that the fact is now there, and we need explanations. We also need to follow closely over 2009 to see just how extensive the problem is. Also, I fear that if I am right we are going to see a number of countries - the Baltics, Ukraine, Hungary, Romania, Ukraine - having a lot of difficulty getting started again even when the global crisis is over. Unfortunately there is no "hidden hand" which makes history a fair process. Well, basically what follows from this theory is that Eastern Europe should be more prone to overheating which makes more difficult rapid economic expansion. I got it right? and this tendency should be exacerbated by capital and workforce moving in opposite directions? Correct? However for this theory to explain the fact that so much of Eastern Europe is on the floor now (many actually are already under), there should be some evidence that these countries were actually overheated or running locally inflated bubbles at the time when the crisis struck. Another thing is that Russia differs in many respects from the rest of the region. It does not suffer from massive migration outflows and in fact attracts millions of migrants from Central Asia and elsewhere. In some countries along Russia's Asian periphery remittances from Russia account for almost half of the GDP. Though I guess I know what you are going to say - the collapse of oil prices and an economy inflated through misuse of petroroubles. I think it's inaccurate to overstate the importance of the Ossetian conflict. Even if we assume that investors fled the RTS due to the war, foreign portfolio investment is a minuscule % of foreign investment (0.5% I think). The real problems were excessive borrowing by Russian firms from foreign lenders, who all simultaneously called in their loans, and the incredible drop in the price of oil and other natural resources, which supply the majority of export revenues in Russia. 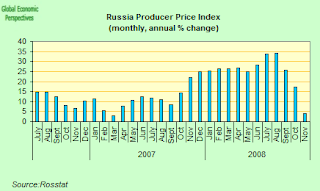 The drop in oil has also produced the ruble crisis that you have diligently covered. Still, I think it is pure coincidence that the Ossetian war directly preceded the crisis, not to say that all of Russia's actions were justified. I would be interested in hearing more about level of household indebtedness in Russia - it was my understanding that it is extremely low. "I would be interested in hearing more about level of household indebtedness in Russia - it was my understanding that it is extremely low." Well I think you are right, it is still comparatively low as a percentage of GDP, but it has been rising ràpidly - from 2003 to 2007domestic credit growth in Russia averaged 45 percent - but this also includes corporates, who undoubtedly have the biggest part of the problem. Also, a sizeable component of the lending was financed by foreign banks, and was in forex, and these banks are either no longer willing or are unable to continue lending. The forex part is a problem in the light of devaluation. But we are seeing the same thing all over the CEE, what were thought to be low levels of household debt just are not holding traction, which brings us back to Nobody's question, and just why they are so much more vulnerable. We don't seem to be seeing the same level of unwind in India or Brazil, for example, despite comparatively rapid rates of credit expansion amongst the middle classes in those countries. In the end all of these are open question. At the moment I am largely trying to document. later we will have plenty of time to go into the question "why" in more detail. "I think it's inaccurate to overstate the importance of the Ossetian conflict." Well everyone has been criticising me over this. But I do think that it is a huge coincidence that the large capital exit started exactly at this moment. Of course it was always going to happen, but I think the idea of yet another round of tension between Moscow and the other members of the G8 was just too much for investors to stomach at that very delicate moment in the financial crisis. I have srcupulously avoided getting involved in the debate about who was right and who was wrong in Georgia itself. I have no real knowledge about this, and certainly have no expertise, but I just think in delicate moments you need to act with extreme prudence, and with the maximum consensus possible. Leaving aside all the other arguments, which are of course numerous, wasn't this exactly the objection to the way the Bush administration went about dislodging Sadaam Hussein. OK, more on the other points when I find another moment. I made the earlier comment about not a whole lot of comments, and I just realized that my browser says there are 0 comments for most entries but when I click on them there are indeed many comments. Glad to see that others are reading as well...one of the very few, well written blogs on Russian macro economy that I have found. Low household indebtedness and tons of corporate debt in forex are probably different expressions of the same thing. Households simply have less access to foreign credit, otherwise they would have been probably just as externally indebted as Gasprom and its likes. I think we can just agree that the summer war has served a trigger for the beginning of capital outflows without going into debates who shot the first bullet in this conflict as it's pretty much irrelevant to the issue at hands. Frankly I bet most people have no more patience left for these Russia vs Georgia debates. Sprry for the delay. Work and xmas etc. "However for this theory to explain the fact that so much of Eastern Europe is on the floor now (many actually are already under), there should be some evidence that these countries were actually overheated or running locally inflated bubbles at the time when the crisis struck." Well first off I want to stress that I don't think demographic dynamics explain everything. It is just one factor to take into account, and may help us understand a bit better what is happening in the CEE countries. But on the overheating thing, there is evidence, lots of it, in the high growth rates that suddenly invert - phase transition like - into sharp contraction, and then there is the smoking gun of all that inflation. Inflation is normally and early warning indicator (and especially producer price inflation) of overheating. The there was the loss of control of monetary policy (policy ineffectiveness) and the srtong capital inflows (forex borrowing at cheaper rates than available domestically). This is why the IMF (and me) among others were proposing strong (3/4 or even 5% of GDP depending) to attack the excess demand directly. "Another thing is that Russia differs in many respects from the rest of the region." Well definitely, not all countries are the same. The Czech Republic - which is maybe the most solid of the group - also attracted net inward migration, sending delegations as far afield as Vietnam and Mongolia as part of their search. The thing is Russia had the huge advantage of all those energy resources, and migrant inward labour to do the extraction side. So all they had to do was manage the domestic economy, and balance out the cash flow from the oil. But this they spectacularly failed to do, accepting pay increases all round as if there was no tomorrow, and allowing companies (and to some extent individuals) to get round local monetary policy and borrow forex at cheaper rates, so the whole thing became very highly levereged. This I don't know but I think they were always like this as far as I can remember and I was following them from the days of Perestroyka. I was actually still there in the beginning. Anyway, they were always somehow doing this combination of failing to tackle inflation properly and not letting rouble to devalue. In fact, it took them so long to get the connection between inflation and money printing that I am not even sure that they comprehend it properly now. I don't mean Kudrin, but people around him. 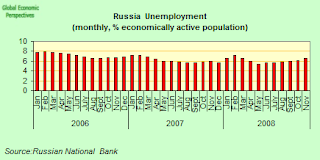 So this was the situation from the beginning, even though it might be less obvious during the first years when the economy was a wreck and nothing held for long including the rouble. I think their way of mismanaging the economy locks them in a very predictable cycle. Lets say in 1998 they defaulted, rouble collapsed and almost immediately the industry started grow. Then the oil and commodities booms have arrived. Then they locked rouble in this corridor, failed to tackle inflation, inflated their bubble with imports driven consumption getting out of hand. This time it will be pretty much a replay of the same story. At some point rouble will collapse, this will give their manufacturers and others the competitiveness they were missing, imports will slump, a lot of internal demand will be destroyed by devaluation. Then the oil market recovers and so it all starts again with the government steadily inflating the next bubble, until something happens and this one will explode too. "I think their way of mismanaging the economy locks them in a very predictable cycle. 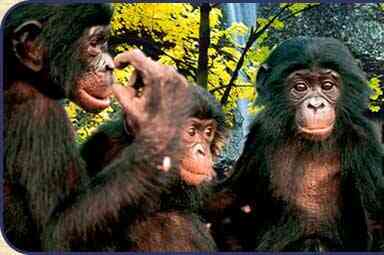 Lets say in 1998 they defaulted, rouble collapsed and almost immediately the industry started grow. Then the oil and commodities booms have arrived. Then they locked rouble in this corridor, failed to tackle inflation, inflated their bubble with imports driven consumption getting out of hand." I fear you may be right here. Which is a very big tragedy, since they don't have the time horizon to go around playing about with this indefinitely, given things like population ageing etc. And don't miss what's going on in the Ukraine right now. The Tymoshenko faction - who surely understand no economics, as you suggest - are now threatening to send the head of the central bank (who may be does understand some) to prison for abiding by the conditions of the IMF loan. Of course, this is all likely to blow up in any moment, and the splash back can reach quite a long way, so look out. I have just done a lengthy post on the Ukraine blog. I am reading your Ukraine's post. I would say that what they are having there is a kind of a very extreme stuff, though frankly I reached the conclusion that they are not very reasonable people. In particular the way they are trying to drag their Russia oriented half of the country into NATO seems to me such a sure recipe to end losing this half if not more. 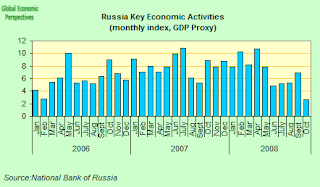 I am more optimistic regarding Russia's long term prospects. Or at least I don't think that demographic decline will be so acute. Russia has a huge border with Asia with dozens of millions of Central Asians and Chinese across the border. In fact many of them are not across but already inside. In the worst scenario people from neighboring countries will simply move in and, in fact, it's already happening. I won't be surprised if it comes out that migrants are already 10% of the population. It's very difficult to control immigration in such a huge and messy country that was made even more corrupt by the last oil boom. They also have a pretty extensive rural immigration or I don't know how to call it; it's less common in the West. There are many migrants who settle in the periphery, countryside, small towns where the xenophobia of the locals is the only form of immigration control they have. I would expect more problems with ethnic tensions and such stuff, but in my view Russia is not about to start running out of people any time soon. Of course, immigration is nor perfect. In particular from Central Asia they are getting a lot of very backward migrants, some are also conservative Muslims. In some places this creates a very tense and explosive ethnic mix. This is much more of a problem in my view. I would not expect any intense demographic crisis. I believe their major challenge will be much more about integrating those aliens, ethnic tensions, identity crisis, stuff like this. "I am reading your Ukraine's post. I would say that what they are having there is a kind of a very extreme stuff, though frankly I reached the conclusion that they are not very reasonable people." Well the whole thing is totaly chaotic, and nobody seems to have any very clear idea about changing things for the positive. "In the worst scenario people from neighboring countries will simply move in and, in fact, it's already happening." Well Russia is resource rich, and that is a huge advantage. So yes, there is a way through this for Russia, but they really do need to make a lot of changes. A path exists, but they need to grasp it. The whole institutional panoramam needs changing and thoroughly modernising. But if they simply follwo the cyclical pattern you mentioned earlier, then it is hard to see them accomplishing this. "I believe their major challenge will be much more about integrating those aliens, ethnic tensions, identity crisis, stuff like this." Well yes. I agree again, but I still think the key challenge is to put in place an institutional structure which can make it all possible. I fear the present crisis may only make things worse, not better. The possibility of a negative, lose-lose, dynamic is non negligible. In general, one should never loose the point if taking about economic development. In standard economic theory, it is taught that we usually have models for short-term (resp. mid-term) development of an economy and then also for the long-run. While for the long-run one of the simplest model (Solow-Model) already gives good explanations and a further expansion (Ramsey-Model) takes further steps, for the short run we have such famous names like Keynes and other economists. In a long-term macroeconomic model, one of the important exogenous given parameters is the growth of a population, which was here already often discussed in practical terms. From a practic point of view, things usually look quite simple, resp. what should be changed looks simple. For Eeastern Europe, we are often faced by the same problems, like ineffective and inefficient administration, wrong policy implementations (often only short-term) and weak institutions. A potential for growth have more or less all countries, but to be honest, african countries (sub-saharan) have also potential and we still face a more or less standing continent. Obviously, we cannot compare the East resp. CIS countries with Africa. But what is commmon there, lot of countries face also the same problems. Fur a further understanding, I can recommend the books of Mancur Olson very much, which gives (though also to be critical to read) a good overview about the problems of the post-sovjet countries and the underlying history. I think most agree, that the key reason for the momentarily economic downturn is the subprime or rather the housing market in the USA. Just to get an imagination of what we talk about, in the $ 14 Trillion mortage market in the USA, 50% are asset-backed and that's a reason why the housing market downturn became a global crisis as investors all around the world participated (in Europe, asset-backed resp. CDO's are much less often, that's why in Spain or also France, a housing crash should remain local). From 2000 to 2006, house prices have risen in the average about 60%. The four most important indicators show since the peak in 2006 a downturn of 20%. The average failouts in the subprime market have risen from 3% to 12%, in the prime from 1% to 2%. An average house takes now about 1 year to be sold, before 4 months. As long as there will be an overhang of houses in the USA, it seems quite unrealistic that the housing market will stabilize. Housing market crisis are in general known as sticky and a recovery may take much longer. Why Eastern European countries are hit that hard? Well, first of all, these countries have relativley often vulnerable economies, basing on some very few production lines (oil, gaz, steel). And obviously, the countries show not the needed political stability in the crisis, as reforms which are needed were not taken. In general, such countries often have more than half of credits denoted in foreign currency, to use the interest rate differential and to make profits - at least they thought they will. But they didn't think so much about the currrency risk (and in general, the theory predicts that there is no free lunch, meaning that you cannot borrow in an other country and invest in yours while making riskfree earnings). As now money got shorter around the world in the meaning that a lot of banks had to write down massivley assets, credits are given in much less extent. This is now the misery of the countries which relied on the foreign investment inflow, which disappears as fast as it came. I just found your blog, and will be going through past posts. Russia is of particular interest to me as I have personal relationshps there as well as some financial stakes. The question I continually ponder is this: while certainly there is a lot of negative appearing activity going on with Russia, at the same time the circumstances today are entirely different than preceding the 1998 sudden stop event. 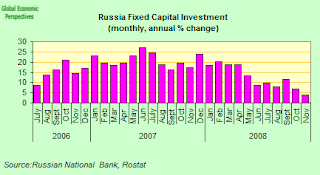 In particular in 1998, the Russian government had large debts it was unable to service. 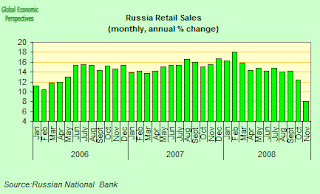 In 2008 and now, it is not the government but the large corporations in Russia whom have this debt. While certainly this isn't going to help the Russian economy, on the other hand so long as no major national vital assets in these indebted companies are lost to foreign bankers via foreclosure, ultimately the debt can be repudiated via bankruptcy. The recent Russian government intervention with Deripaska/Norilsk Nickel seems to me a possible sign. Secondly a weakening ruble is bad for the Russian consumer in the sense of propping up the inflationary environment, but it will serve to reduce Russia's imports in this present bout of low energy prices - which in turn are affecting Russia's exports. Again if Russia had a sovereign debt problem this would be fatal, but as both a large foreign exchange reserve holder and a (so far) currency account surplus nation, I still cannot see why the doom and gloom. There are going to be job losses due to these Oligarch's companies shrinking, but it is no different than any other business cycle recession.